Home Health and vet Changing stallion behaviour may come at a risk! Changing stallion behaviour may come at a risk! DUE TO THE HIGH LEVEL OF INTEREST IN THIS ARTICLE IT HAS BEEN OPENED IN IT'S ENTIRETY TO NON-SUBSCRIBERS. PLEASE LEAVE YOUR COMMENTS ON THIS ARTICLE AT THE BOTTOM OF THE PAGE - PLEASE NOTE ALL COMMENTS ARE MODERATED. For as long as people have been showing horses, there have been trainers, exhibitors and owners who have sought to use substances to alter a horse’s behavior or performance. One hundred years ago, heroin and cocaine were used to stimulate horses and enhance performance. Nitroglycerin, ginger, capsaicin, belladonna, snake venom – all are substances that have been used in the past to gain some advantage. Usually it was to increase speed or endurance. But not always. One could also use sedatives to control an unruly animal. Pain-killers could be used to keep a horse running, showing and winning – up to a point. However, once rules were enacted to test for drugs both at racetracks and show venues, the landscape shifted. And as quickly as a test became effective for a performance-enhancing drug, another drug arrived on the scene. Those wishing to influence a horse’s behavior became amateur pharmacologists, staying one or two or three years ahead of the development of tests for what they were using. For quite some time, it has been something of a ‘dirty little secret’ in the sport horse world, as well as the racing industry, regarding the use of agents to block the hormone Gonadotropin Releasing Hormone (GnRH) production in the horse. What does that do and how does it affect a horse’s performance? GnRH is sort of the ‘master’ hormone that regulates two other hormones, Follicle Stimulating Hormone (FSH) and Luteinizing Hormone (LH) in the horse. In the stallion, for example, if GnRH is blocked, then it cannot stimulate the production of LH, which is what causes the Leydig cells in the testes to produce testosterone. If there is no LH production, the testosterone production decreases. When testosterone decreases, unwanted stallion behavior also decreases. However, this also has a negative impace on sperm quality and fertility. In earlier times, progesterone was used as a means of reducing unwanted behavior in both stallions and mares. Progesterone, the hormone of pregnancy in mares, when given to stallions, decreases both testosterone levels, and LH levels. A seminal study done in the mid nineties at Colorado State University (USA) demonstrated that synthetic progesterone did reduce testosterone production and libido in stallions. And was often used in the show arena for that purpose. However, progestogens are weakly anabolic, and thus considered a steroidal hormone so became prohibited for use in horses in many countries and is on the FEI’s Equine Prohibited Substance List (EPSL). There are certain substances that can also be used to decrease testosterone in stallions, in effect, ‘chemically castrating’ them. While the FEI does not prohibit chemical castration of stallions, the two substances most generally used, chlormadinone acetate (sold under brand names such as Non-Ovlon, Gestafortin and Chlordion) and Delmadinone acetate sold under the brand names ( Tarkak, Delmate and Estrex among others) are both on the EPSL of the FEI. However, another way was developed to control a stallion’s behavior by lowering his testosterone level and it involved vaccinating the animal against the hormone Gonadotropin Releasing Hormone (GnRH). Currently, there are two GnRH vaccine products that are being used for this purpose in the show and race world. One, available In Australia, goes by the name Equity™, and was developed for use in mares. It was developed to suppress estrus in mares and to decrease the unwanted behavior linked to estrus. It was a more labor friendly and economically useful product to use as opposed to Altrenogest™ (synthetic progesterone) which must be given to mares on a daily basis and can be quite expensive. Also, because of the anabolic hormone properties, Altrenogest™ is on the FEI’s EPSL. Equity™ is specifically labeled not to be used in mares that will be used for breeding and is not labeled for use in stallions at all. Another product produced in Europe for use in pigs, goes by the name Improvac™. Improvac™ was developed to decrease the amount of ‘boar taint’ in pork meant for human consumption. This occurs by decreasing the testosterone level in boars given the product. When a GnRH vaccine is injected into either stallions or mares (one injection and then a ‘booster’ after four weeks) the vaccine will cause the horse’s own immune system to develop antibodies to GnRH. This would, in effect, ‘block’ the ability of GnRH to function. In horses, the use of a GnRH vaccine has been useful to cause a profound drop in testosterone in stallions as a means of birth control in wild horse populations. It is also used for birth control in mares, preventing them from developing mature follicles and ovulating. This use of a vaccine against GnRH for population control in wild populations of horses (Gona-Con Equine) is well documented. The equine venereal disease, Equine Viral Arteritis (EVA) causes abortion in mares and can cause death in young foals. Some stallions that contract EVA can continue to shed the virus, even when all symptoms have stopped. There has been some documented success in stallions that persistently shed the EVA virus, and when treated with the GnRH vaccine were able to clear the virus from their system. This occurs because of the dependence of the EVA virus on testosterone. However, this result has been variable. While the vaccine is clearly labeled ‘not to be used on breeding horses’, the apparent possibility of controlling unwanted stallion behavior has proven to be irresistible to some in the show and racing industry. It must also be said that there are many anecdotal reports of using the vaccine in mares to decrease their unwanted estrus behavior as well. It would seem, therefore, that controlling horse behavior by an introduced substance could be considered a performance enhancing situation. An exhibitor whose dressage stallion stays focused and does not respond to mares in the vicinity has an advantage over another exhibitor whose stallion or mare vocalizes, or becomes belligerent or uncooperative at a competition. As in the past, testing for any performance enhancing substance has to keep up with the substances being used. However, at the present time, the FEI does not prohibit the use of a GnRH vaccine in stallions as long as it is recorded on the horse’s passport. Initially, there was much anecdotal evidence that giving these intramuscular (IM) injections to stallions often resulted in large, painful swellings at the injection site. This can usually be attributed to the adjuvant (carrier for the vaccine). In more recent years, the reports of adverse reactions have decreased and most likely the adjuvant has been modified or changed. The biggest issue, however, in using these products is in the effect on the stallion’s reproductive future. Several studies have been done over the years on the effects of the GnRH vaccine on stallion fertility. The take-home message from these studies is that the effect on the stallion’s fertility can, at best, be variable. The majority of stallions exhibited a significant decrease in testosterone production by two weeks after the first injection. Also the majority of the stallions exhibited a decrease in libido and stallion sexual behavior. However, while many of the stallions returned to their pre-treatment fertility status, many stallions did NOT. In fact in some instances, stallions still had reduced fertility six months later and some up to a year after treatment had stopped. Since none of the papers followed the stallions after one year, it is unknown how long the effect lasted in these stallions. There was not a consistent response in stallions and several stallions did not respond to the treatment at all. The reason for this would appear pretty clear cut. More disturbingly, there have been many reports of stallions being sold as breeding animals that have had very different fertility parameters pre and post show career. 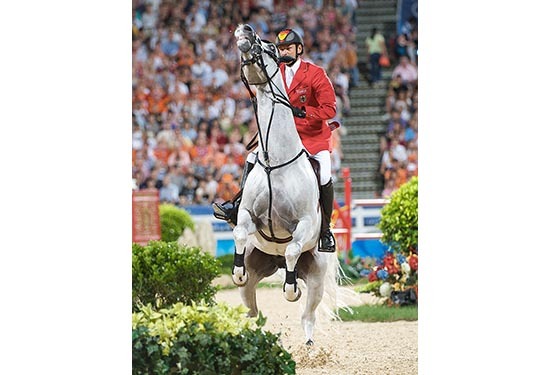 Certainly, there are many factors that can affect a stallion’s fertility during a competitive career. Age, stress, health status – all can have an influence. However, what if one wanted to find out if, in fact, a stallion had been given a GnRH vaccine product? Because of the concern over the use of GnRH in race horses, a study was conducted in France and published in 2015. A small number of stallions (n=4) were given the Improvac™ vaccine and tested in two ways. First of all the blood was tested by the ELISA method for the detection of antibodies to GnRH. It was found that the antibodies to GnRH could be detected for up to 200 days after the first injection of the vaccine. Secondly, the stallion’s urine was tested for testosterone levels. In all four stallions, their urine tested in the same testosterone range as mares and geldings, thus identifying them as having abnormally low testosterone levels. Therefore, it appears that there may be methods available to test for the use of a GnRH vaccine in stallions by combining both methods of testing. It certainly bears further examination if testing for the GnRH vaccine is determined to be of value. At the end of the day, if a stallion owner, trainer, veterinarian or exhibitor decides to use this product off-label in stallions, it is at their own risk. It could result in a stallion that may have reduced fertility for a long time. It is something of a devil’s trade off – you might have a stallion that is tractable and has a stellar show career. However, when mare owners come calling to breed to that stallion, they may find no joy. But, is chemical castration worth the risk? Editor’s note: This article was researched and published at the request of a ‘concerned’ European breeder, and will hopefully generate debate among the key stakeholders in the sport horse breeding industry. 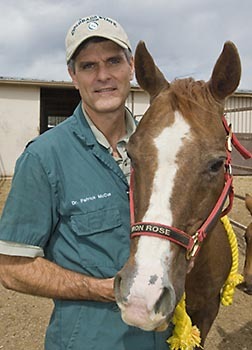 We are extremely grateful to our regular ‘Health & Vet’ contributor Cindy Reich for speaking to Dr. Patrick McCue (see photo), who received a PhD in Comparative Pathology, with an emphasis on reproductive endocrinology and ovarian pathology in the mare from UC-Davis in 1992. He was awarded as the Therogenologist of the Year in 2017 by the American College of Theriogenologists. In that same year he was awarded by Colorado State University for his lifetime work in equine reproduction.